What is your favorite thing about Baylor Law? My favorite thing about Baylor Law is the friends I have made. When I came to Baylor, I did not expect to encounter so many like-minded people. I have enjoyed working alongside my peers, getting to know each other, and challenging each other to excel in every area of life. What activities are you involved in, and what do you enjoy doing during your free time? I am involved in BPILS. I helped with Adoption Day by decorating in the days before and by manning a game station to entertain the children as they waited for their court room appointment. I am also part of a moot court team. My team traveled to Chicago with Professor White to compete in the Appellate Lawyer’s Association Competition. During my free time, I enjoy being a member of Antioch Community Church. I also enjoy working out and watching the occasional movie with my law buddy. My goal is to help those who do not usually have access to legal services. I do not know how, or in what setting I will do that. I am currently externing with Greater Waco Legal Services where my supervising attorney has done just that. I have been encouraged to learn that there are firms and nonprofits doing what I dream of doing. I plan to join a nonprofit like GWLS upon earning my JD. Why did you choose Baylor Law? I chose Baylor because I wanted to be in a place where I could learn what it means to be a Christian attorney. I wanted to learn how I can stay true to my faith as I practice law. Thus far, Baylor Law has allowed me to see professors, staff members, and my fellow classmates work hard in the academic setting while also giving significant amounts of time and energy to serving the community. I have run into my peers at church and at service opportunities. I have enjoyed deepening my relationship with Jesus in the academic setting and in the city of Waco. 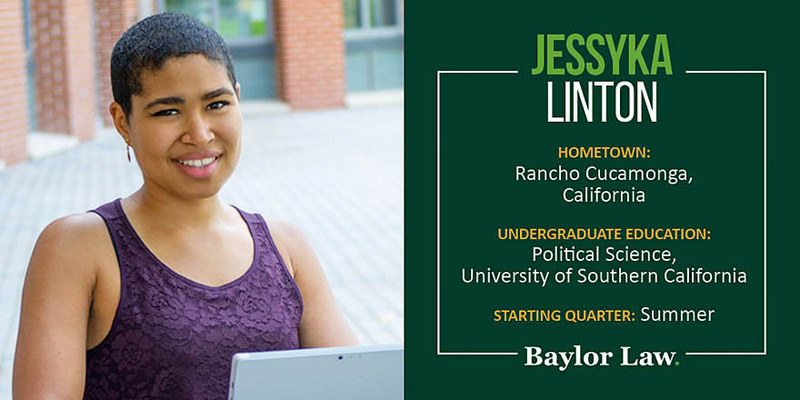 I also chose Baylor because I wanted to be in a place where I could live a balanced lifestyle. Having things like Cameron Park, the Bear Trail, the Brazos River, and a farmer’s market all within fifteen minutes of the school is important to me. I have enjoyed being able to take deep breaths in a natural setting without having to travel great lengths.